Exploring the coastline and national park of Land's End on the Gaspesie Peninsula of Quebec, Canada. We spent part of the morning exploring the town of Perce before continuing on towards the town of Gaspe where we stopped briefly at the Cathedrale du Christ-Roi - the only wooden cathedral in North America, then at the monument to Jacques Cartier who first claimed the region for France in 1534. Our sights were set on the Forillon National Park for starters which features an historic settlement in Grande-Grave with several old buildings and houses. The coastal scenery here is also quite pretty although not so dramatic - it does feature interesting cliffs and rocky outcrops. Our next stop in the Forillon National Park was the La Chute, a waterfall which plunges 17 metres and is accessed by a series of boardwalks, stairs, and dirt track. The track itself drops 50 metres and wends through the dense forest which by this stage in September was beginning to reveal luscious colours of autumn. Leaving the Forillon National Park, we stopped off near the Cap-des-Rosiers Lighthouse, an historic monument since 1977 and the highest lighthouse in Canada, before continuing around the Gaspesie Peninsula. 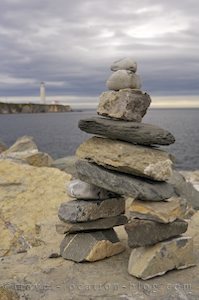 A stone figure made an interesting feature in the foreground of a picture with the lighthouse in the background. Several stops later and another lighthouse - the Point-a-la-Renommee Lighthouse dubbed the most travelled lighthouse in the world, we caught the final rays of sunlight along the St Lawrence Coast near the town of La Martre before setting up camp for the night in Ste-Anne-des-Monts.